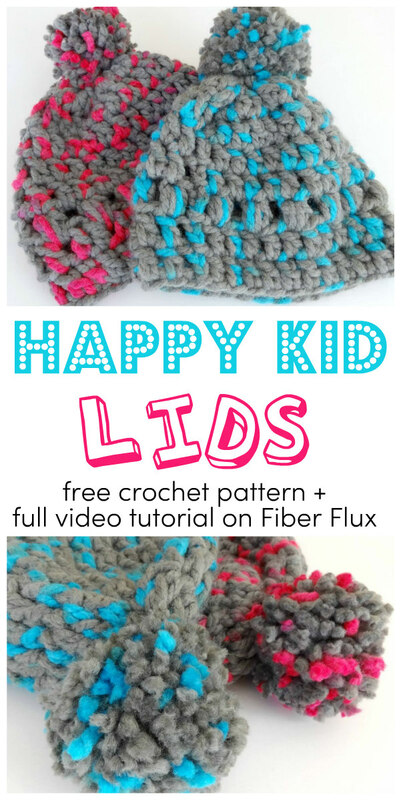 Fiber Flux: Free Crochet Pattern...Happy Kid Lids! 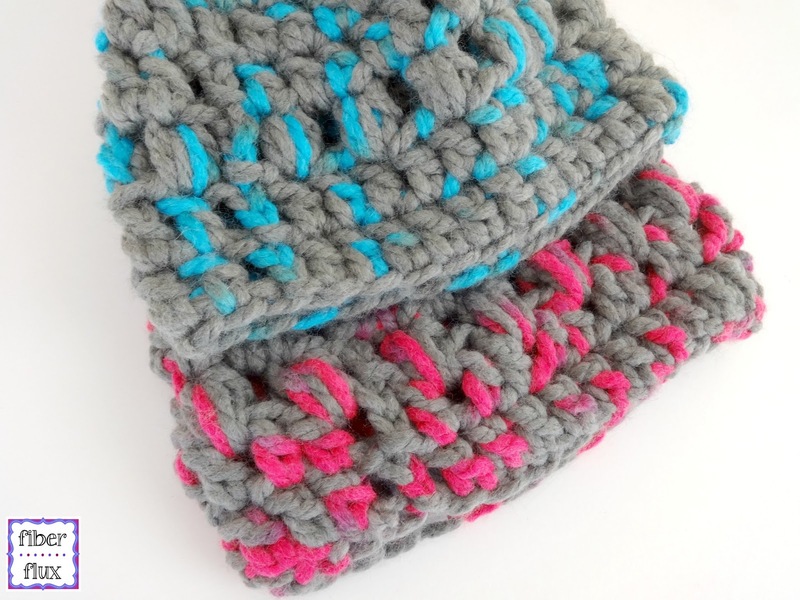 Free Crochet Pattern...Happy Kid Lids! 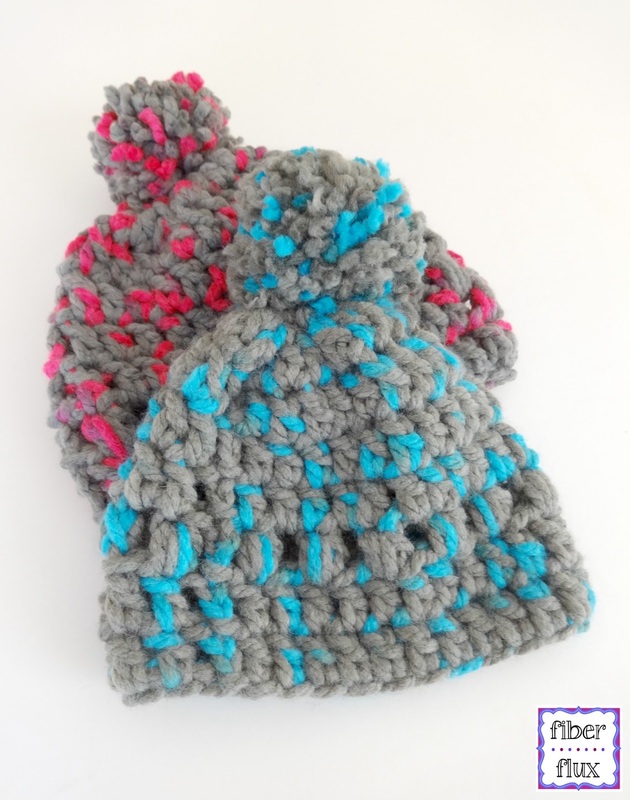 I made these fun hats because we are having a really cold week...like living in Antarctica kind of weather! 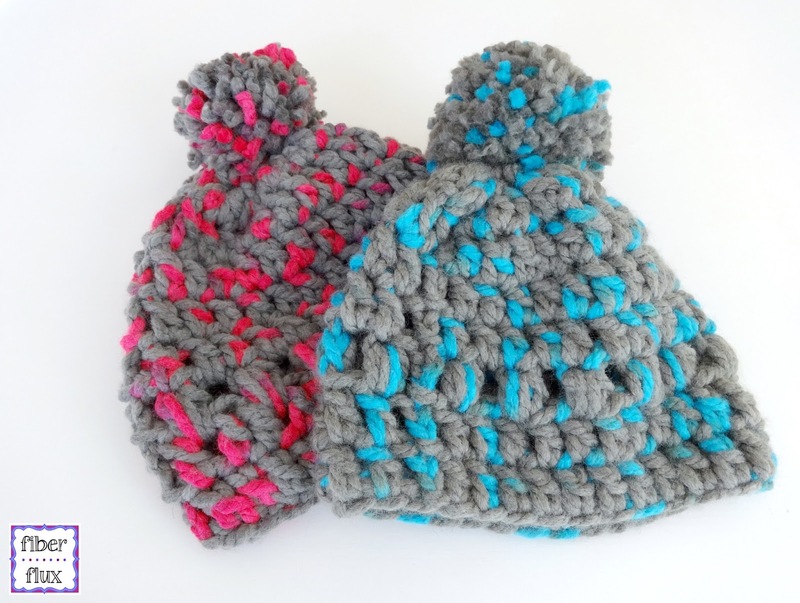 These Happy Kid Lids are super lofty, cozy, and warm. 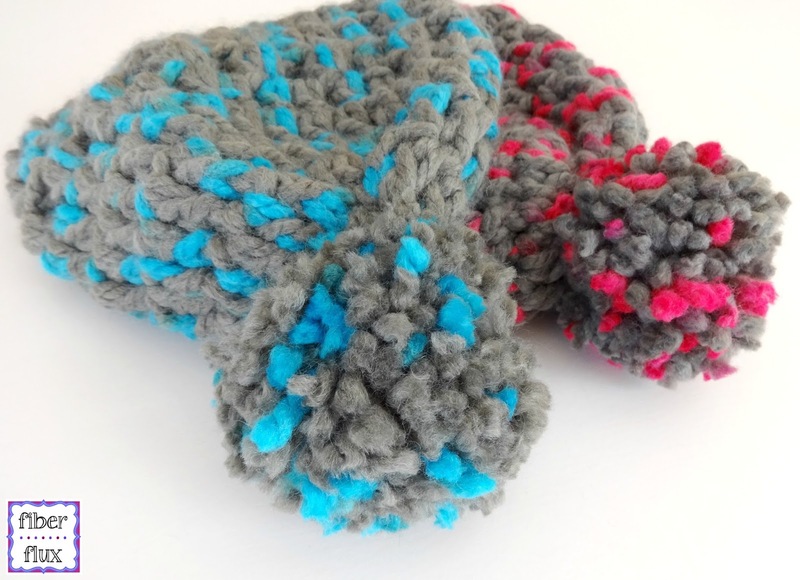 Crocheted with a big hook and thick yarn, they work up very, very fast in just 8 rounds too! A big and fun pom pom tops it off nicely...this is a great hat to keep those little heads warm. Just as a side note, my kids love, love, love these hats, so field tested and got the seal of approval too...always a good thing! 1 Skein Lion Brand Wool Ease Thick & Quick (colors shown are "Flamingo" and "Blue Jay"
Note: Hat is very stretchy and will fit lots of heads, but if you need to change the size, just make your starting chain in any even number to begin. Ch 30 (Note: If you desire a different size, just make your starting chain any even number). Join with a sl st in the furthest ch from the hook. Round 1: Ch 3 and work a dc in each chain around. Join with a sl st to close round. Round 2: Ch 3 and work a dc in each st around. Join with a sl st to close round. 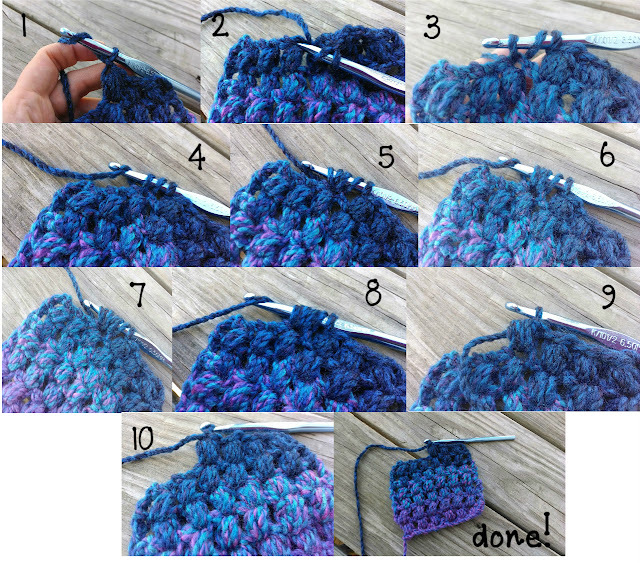 Round 3: Ch 3, the in the first space (not stitch this time), work a puff st (see below for photo tutorial), then ch 2. *Skip the next space, then in the next space (puff st, ch 2). Repeat from * to the end of the round, then join with a sl st to close round. Round 4: Ch 3, then work a dc in the top stitch of the first puff stitch from the previous round. *dc in the next space (ch 2 space from previous round), then a dc in the top st of the puff st from the previous round. Repeat from * to the end of the round, then join with a sl st to close round. Round 5: Ch 3 and work a dc in each st around. Join with a sl st to close round. Fasten off leaving a long tail (12-18 inches) for cinching the top. Insert into the chain (if working the foundation row) or top of the stitch from puff of previous row (if working row 1) and draw up a loop. Work the number of chains per the pattern (in this case 2) and you're finished! To finish and assemble, see below. Finishing & Assembly: When you are finished crocheting your hat, you'll have a tube. Turn the hat inside out, thread the remaining tail with a tapestry needle and whip stitch the top leaving an inch or so in between stitches. Slide the top of the hat together by pulling on the tail and sliding the hat to cinch the top and then tie a knot (or two) to secure. Weave in ends. Make a pom pom for the top with remaining yarn and tie to the top. what age of child would this fit? Is it to big for a 12 month old?